General MISSION STATEMENT: "I want my music to be a source of encouragement to people all over the world. The Gospel is the message of hope to so many oppressed people. It is my prayer that my music will bring people closer to finding a personal relationship with Jesus Christ." Goal of THROUGH THE RAIN CD: " I truly hope that the words and music of this record reflect the heart of God in a way that draws his children closer to His side." Psalm 107:29A - He stilled the storm to a whisper." Wayburn Dean and team have done it again! THROUGH THE RAIN offers a stirring variety of inspirational contemporary Christian music, offering hope and encouragement for us all, as we struggle with our evolving faith journey; with our efforts to serve Him in love, and with our resolve to trust and depend on the Lord during times of adventure and trials, that are part of the experience of living in this world. This collection of songs offer a wonderful combination of inspirational vocals, lyrical messages, and an upbeat variety of a blend of genres, creating some memorable melodies, rhythms, and vocals, that come together to present the lyrical messages which so inspire the listener, as they inspired this reviewer. Wayburn Dean is a Christian music artist who is not only gifted with a rich, well-trained voice, to present songs in such a way as to both encourage belief in Jesus (DO YOU BELIEVE? ), service to the Lord ( WHAT WILL BE YOUR LEGACY?) and gratitude (CROWN HIM) to the Lord, while entertaining the listener, but also has the ability to vocally lift the listener up from any dour or discouraging mood one is suffering from, and into the presence of Lord (I SURRENDER ALL * FIRST LOVE). Wayburn Dean sings from his heart, expressing his faith in the Lord (THROUGH THE RAIN), giving testimony to how great our Lord is, a source of strength (MORE THAN ENOUGH) and encouragement (I NEED A SAVIOR), always dependable and faithful to his children. Let's talk about the lyrical messages that Wayburn delivers so well, that encourage our walk with the Lord on several levels; during good times and times of adventure and trials, and faith-building experiences that ultimately can grow our relationship with Him. Wayburn Dean and friends have it covered! SONGS OF FAITH AND LOVE FOR THE LORD - Our relationship begins with the Lord when we recognize our need for a Savior, believing who He is, and showing gratitude to Him for his love, mercy and faithfulness. I SURRENDER ALL - "Lord, I give myself to thee. I will ever love and trust Him"
CROWN HIM - "He is Jesus and He's Lord of everything. How can they know unless we tell them." FIRST LOVE - "I will always remember when I gave my life to You. The joy that filled me has kept my heart anew." A CHANGE IS COMING - The Lord can be depended upon to change our hearts to help us do what we are called to do. "I haven't done what I said I would do / But I feel my heart giving in to you//"... "There's a Change coming over me." THROUGH THE RAIN - "When we call, He comes: When the strong winds blow, Ya just gotta walk in faith." MORE THAN ENOUGH - "God Almighty, He declares, My love is more than enough for you." I NEED A SAVIOR - "Jesus is our Savior whose love will never leave us." WALKING WITH THE LORD: Another way we grow spiritually in Jesus - Showing God's love. DO YOU BELIEVE? - Begins with believing in who Jesus is, and acting accordingly - "His word is true, He is Lord, He is God, He is Able." WHAT WILL BE YOUR LEGACY? - "Getting house in order, with the love of God in mind"
THE LEAST OF THESE - "Share your blessings with the poor, you'll receive so much more." Another outstanding quality of these songs is the variety of melodies and rhythms, that fit perfectly for each mood and theme of the songs performed. Compositions offer a great variety of music, from stirring prayer hymns to anthems of encouragement to praise and worship songs, with an assortment of different rhythms to keep the music interesting and irresistible. Another plus is that the sound mixing on this album is well done, allowing the listener to enjoy not only the wonderful vocals, but also the solid yet delicate ensemble work, that make good use of the piano, acoustic guitar, keys, horns, and electric guitars and drums / synths in more lively offerings found on this CD. This reviewer's favorites on this album: Though the whole album is truly uplifting and captivating, I managed with a lot of effort, to come up with my four favorite songs. To see why, visit the song evaluation page. 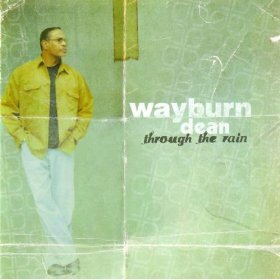 Wayburn Dean's collection of songs found on this album THROUGH THE RAIN is truly a MUST for anyone's music collection, as it will bless and uplift the listener in a most entertaining way, in the true spirit of inspirational music.